A few summers ago we were fortunate enough to visit Voodoo Doughnut‘s in Portland. We had heard about this place from Anthony Bourdain’s ‘No Reservations’ and also on Man vs Food so obviously we had to try it! 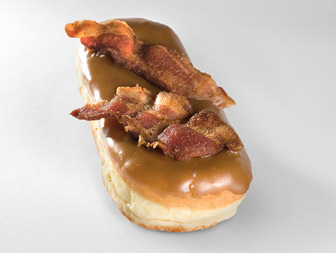 Even though it was a few years ago, I can still remember the incredible taste of the ‘Bacon Maple Bar Doughnut’ and the quirkiness of the signature ‘Voodoo Doll Doughnut’. What I couldn’t really remember was the customer service or ambiance within the shop. So I was excited to read an article today about life as a Voodoo Doughnut employee. Two things that stood out for me from the article were, the attitude of the staff towards customers and the amount of money that was being made selling doughnuts, and I am talking a lot of money! This article is definitely worth a read and despite the negative annotations from the author I would, without doubt, recommend visiting Voodoo Doughnut’s if you are ever in Portland, Oregon! Next Finally I see what all of the fuss is about!